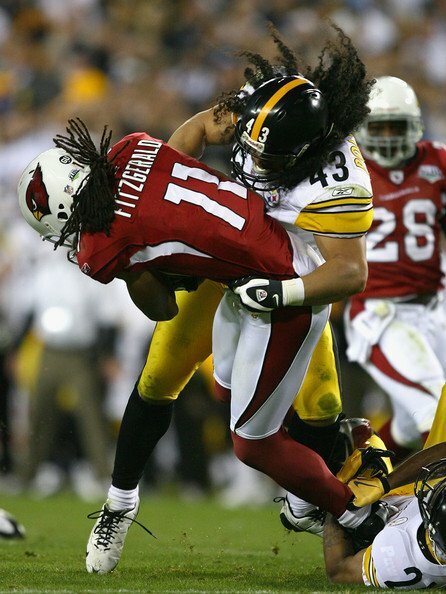 It looks like the Steelers and Cardinals will not be making it to the Super Bowl next year seeing as how their most important players, Troy Polamalu and Larry Fitzgerald, respectively, are going to have season-ending injuries in the first few games. For the first time in its storied — some say cursed — history, the cover of EA Sports’ “Madden NFL” video game will feature two cover athletes: Pittsburgh Steelers safety Troy Polamalu and Arizona Cardinals receiver Larry Fitzgerald. Never before have we seen two players absorb the Madden curse at once. And adding the fact that Madden will not be announcing any games this upcoming season will only make it worse. I wouldn’t be shocked if one of these guys got career-ending injuries. I’m not hoping for that to happen, I’m just saying. I wonder if the players’ who are featured on the cover have their insurance go up when the company finds out about it. The good news for Lions fans: Detroit plays both of those teams this year. The bad news: The curse still will not be enough to help them win those games. You are currently browsing the archives for the Arizona Cardinals category.